We recently received the information shown below from Tim Strickland concerning NTC. He in turn had been assisted by Bob Douglas. 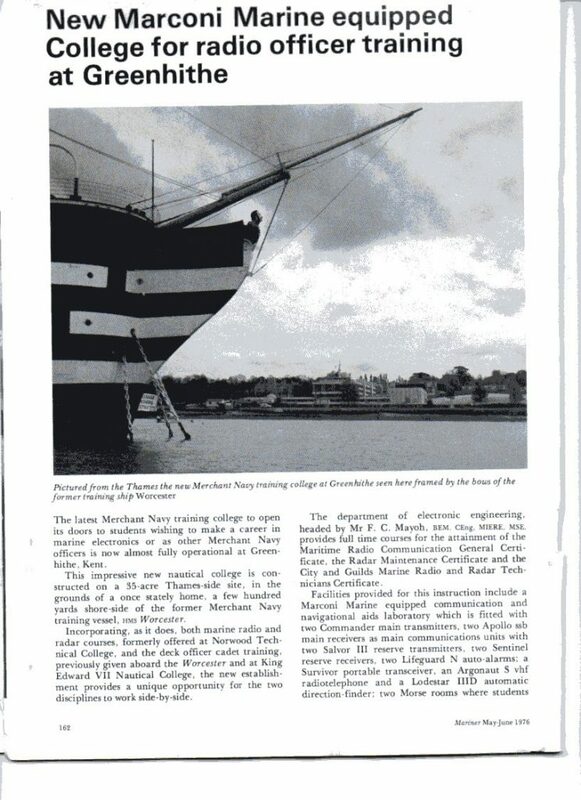 In 1952, Norwood Technical College, in southwest London, began offering training for aspiring Radio Officers for the Merchant Navy. It was one of the first (if not the first) local education authority colleges to offer such training, which hitherto had been provided by private establishments such as Book’s Bar, Colwyn Bay and Earls Court. Training, which was carried out by the Telecommunications Department of the college, led to the PMG Second Class Certificate, the PMG First Class certificate and the BoT Radar Maintenance Certificate. Interestingly, back in history the college had a marine connection. In the 1860s, the college, then known as The Lower Norwood Working Men’s Institute was presented to the community by the philanthropist Mr Arthur Anderson. Mr Anderson was the founder of the P & O shipping line. In 1894 it was renamed as the Norwood Technical Institute. In 1904 it passed to the London County Council, LCC, Education Committee and had another name change in1948, this time to Norwood Technical College. With the demise of the LCC in 1965 it became a college of the Inner London Education Authority ILEA. 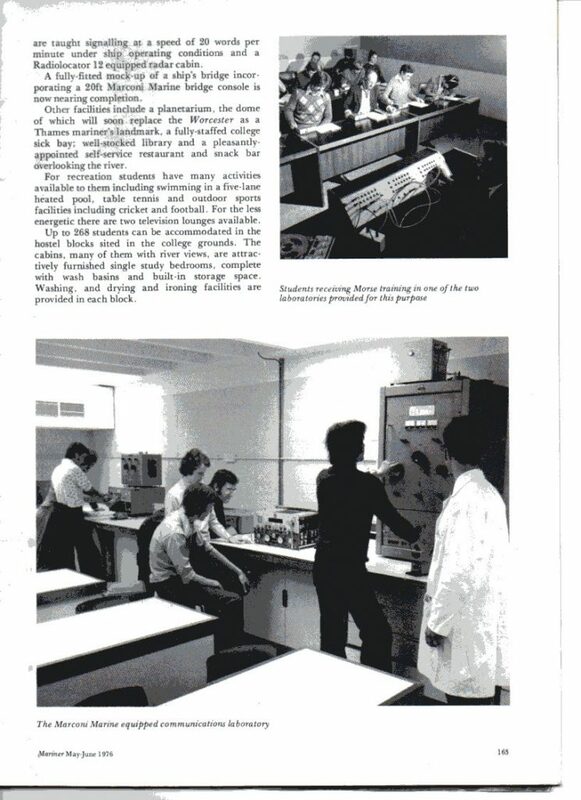 I returned to the college in 1961 as an Assistant Lecturer, Grade A teaching on the Marine Radio Courses. These had grown in size with at one time an entry each term. Shortage of accommodation was always a problem and students at this time will remember having to move around from the main building on Knight’s Hill to a dilapidated Congregational Church down Chapel Road which housed the main Radio Cabin and Morse Room, or the Co-operative Hall further down Knight’s Hill. Some consolation was provided for travellers between the main building and its annexes – by way of “the Rosemary Branch” on Knight’s Hill and the “Bricklayers’ Arms” on Chapel Road. Courses continued for the next decade or so, adjusting to accommodate for changes in syllabus and the eventual replacement of the PMG 1st and 2nd Certificates by the MRGC, the Marine Radio General certificate. (I found a pay chit recently that showed as an Assistant Lecturer in 1963 I was earning £1008 annually!) Staff now involved with the Marine Radio courses included, Phil Smith, Ron Walker, George Winkle, Ernest Gibson, Doug Teer, Bob Tritton, Ziggie Brezeski, George Teasdale, Barrie O’Sullivan, Dave Witteridge , Ben Baxter and Bruce Purslow. My apologies to all those I can’t remember. In 1970 the college had another name change, now becoming South London College and it underwent a major rebuilding process. At about this time ILEA was considering rationalising its nautical training provision. Over the years it had become responsible for Pre-sea training at the Incorporated Thames Nautical Training College – on board HMS Worcester – at Greenhithe in Kent, deck cadet training leading to the Second Mates Certificate of Competence at the King Edward VII Nautical College in east London, Mate and Master training and qualification at John Cass College in the City of London, marine engineering training at Poplar College and marine radio training at South London College. Instead of taking the opportunity of bringing all these strands of training together, ILEA decided to tackle the problem piecemeal. The real urgency was to deal with the problems of HMS Worcester and the Edward VII College. Pre-sea training was on the decline and anyway the Worcester had become too expensive to maintain. Edward VII was becoming less popular with ship owners due to poor facilities in particular the antiquated living accommodation offered to their cadets. So it was decided to build a new college in the vast grounds associated with the Worcester (owned by the Marine Society and leased to ILEA at a peppercorn rent) to cover the work of the ship and Edward VII College. Merchant Navy College was born. Frank Mayoh became the new Head of Department and several staff also moved, Bob Douglas, Ernest Gibson, Barrie O’Sullivan, Ziggie Brezeski, Phil Smith, Dave Witteridge, joined by new members Roger Taylor, Ted Ramsdale, Eric Saunders. Various members of staff joined the Department including Simon White, Peter Brown, Tina Haynes, Tim Strickland, Alan Gray. Again, apologies to those whose names I’ve forgotten. Over time courses were changing with modified syllabuses and the coming of BTEC. 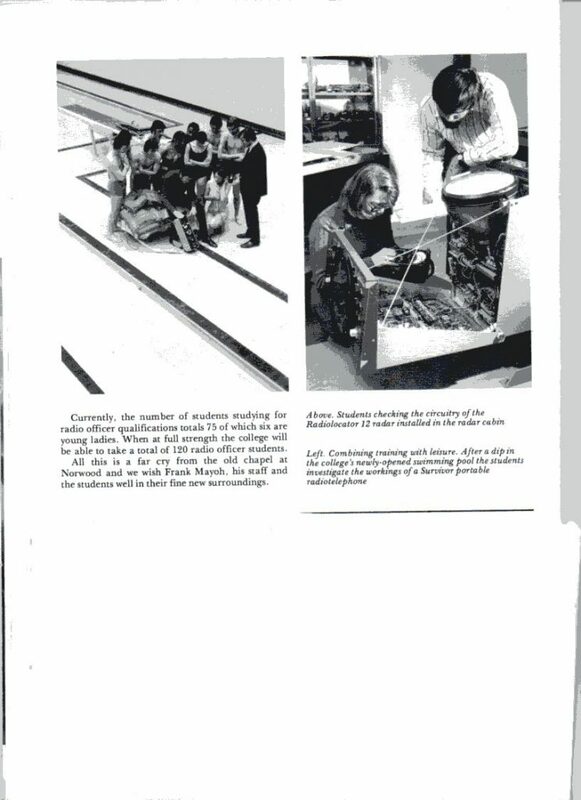 The Electronic Engineering Department was bigger than the Nautical Studies Department and was now keeping the college viable. But circumstances in the shipping world were changing fast. The British Merchant Navy was in rapid decline even before containerisation had taken hold. Less marine radio students were going to sea though numbers kept up as the training was popular with shore establishments notably GCHQ and the CAA. In conjunction with the Metropolitan Police, the college devised training courses for their communications engineers. Compared with the Congregational Church and Co-operative Hall of Norwood days, MNC Greenhithe was like a palace. But amongst the staff there was, from the very start, a feeling that it was too good to last. By the mid-1980s it became obvious that the future of the college was doomed. ILEA was becoming more and more disenchanted with MNC. The training of Officers (of any description) was considered elitist, not in line with the ever more left-wing ethos of the Authority. The college was far outside the normal boundaries of the Authority and an expensive establishment to maintain. Furthermore, the majority of students did not come from inner London. The facilities for nautical training were never completed. The ship’s bridge was never finished and the planetarium never even started. The number of Deck Cadets coming for training dwindled to none. The college could not compete with rivals that were equipped with fully simulated ship control. In the early 80s ILEA transferred what was left of Marine Engineering from Poplar College. This was a disaster and only survived a couple of years. To cap it all, Marine Radio was about to change. Radio Officers would become redundant within the next decade as ships’ communications went over entirely to satellite. The final nail in the coffin was the decision by the Government, in the mid-1980s to disband ILEA (along with the GLC) its work and control being passed to the individual inner London councils, none of which were prepared to take on MNC. With the decline of nautical education of any kind at Greenhithe, the Marine Society were keen to take back the 35-acre site which could be sold for housing at a time of a building boom. Valiant efforts were made by the staff to find another interested party to take over the college, for example a local Kent authority, but to no avail. Merchant Navy College, Greenhithe, finally closed in July 1989. It was demolished a few years later and the site developed by Crest Nicholson as a housing estate, Ingress Park. South London College did not do much better. After being rebuilt in the 1970s it, too, was demolished in 1990, again, to be replaced by housing.